There is an experiment I'd love to conduct. I'd like to survey a cross-section of Americans and ask them how many active NBA players, Major League Baseball players, and American Idol finalists they can name. Then I'd ask them how many living American poets, playwrights, painters, sculptors, architects, classical musicians, conductors, and composers they can name. I'd even like to ask how many living American scientists or social thinkers they can name. Fifty years ago, I suspect that along with Mickey Mantle, Willie Mays, and Sandy Koufax, most Americans could have named, at the very least, Robert Frost, Carl Sandburg, Arthur Miller, Thornton Wilder, Georgia O'Keeffe, Leonard Bernstein, Leontyne Price, and Frank Lloyd Wright. Not to mention scientists and thinkers like Linus Pauling, Jonas Salk, Rachel Carson, Margaret Mead, and especially Dr. Alfred Kinsey. I don't think that Americans were smarter then, but American culture was. Even the mass media placed a greater emphasis on presenting a broad range of human achievement. I grew up mostly among immigrants, many of whom never learned to speak English. But at night watching TV variety programs like the Ed Sullivan Show or the Perry Como Music Hall, I saw—along with comedians, popular singers, and movie stars—classical musicians like Jascha Heifetz and Arthur Rubinstein, opera singers like Robert Merrill and Anna Moffo, and jazz greats like Duke Ellington and Louis Armstrong captivate an audience of millions with their art. The same was even true of literature. I first encountered Robert Frost, John Steinbeck, Lillian Hellman, and James Baldwin on general interest TV shows. All of these people were famous to the average American—because the culture considered them important. Today no working-class or immigrant kid would encounter that range of arts and ideas in the popular culture. Almost everything in our national culture, even the news, has been reduced to entertainment, or altogether eliminated. As Bugs enters the scene, the orchestra members start saying worshipfully, "Leopold! Leopold!" 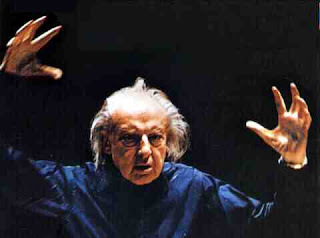 Of course, they mean Leopold Stokowski, the famous mid-20th-century conductor. I watched that Bugs Bunny episode as a kid 30 years ago and had no idea who they were referring. But you have to recall that those cartoons were made for movie theatres, to be shown before main attractions, so the audience would have been adults by and large.